Evolutionary bending by the natural selection dilation (blue curve) and contraction (red and green curves) of natural selection time. 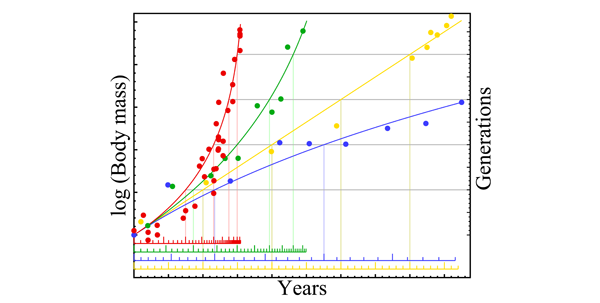 Dots are time and mass scaled body mass data from the fossil record: red:horses; green:maximum mass for whales; yellow:maximum for all mobile organisms; blue:maximum for trunked mammals. Elaborated from Witting (2016c). In a new release on bioRxiv (Witting, 2016c) I use the “allometries are selected by the selection of metabolism and mass”-hypothesis (Witting, 2016a) to study the evolution of body mass and allometries in time. This shows how a contraction of natural selection time from the primary selection of metabolism, and a dilation of natural selection time from the primary selection of mass, are explaining four different bends of body mass evolution in the fossil record. where the rate of evolutionary change in mass (d w / d t) in physical time (t) is a power function of mass (w). The bending exponent (x) is one for unbend evolution, it is smaller than one when evolution is bend downward by a dilation of natural selection time, and it is larger than one when evolution is bend upward by a contraction of natural selection time. The natural selection of metabolism and mass, that explains allometries (Witting, 2016a) and major lifeforms (Witting, 2016b), was then used to show that the bending exponent (x) evolves from the relative importance of metabolism for the evolution of mass, with the exponent being dependent also on the spatial dimensions (1D, 2D, 3D) of the interactive competition in the population. When the importance of metabolism is insignificant we predict Kleiber scaling, where elephants live much longer the mice. For this we expect a biotic time dilation and a downward bend trajectory (blue curve). Yet, the body mass trajectory of fossil horses is bend strongly upward (red curve) with an exponent of 1.50 (Witting, 1997). This indicates somewhat surprisingly that the lifespan of the horse has declined quite a bit while its mass increased from about 25 kg to 500 kg over 57 million years of evolution. The analysis shows not only that the 3/2 exponent for the horse is explained by a body mass selection that was driven entirely by metabolic acceleration; but more generally that body mass evolution varies over a continuum of four modes of selection (the four curves); with each mode being confirmed by a unique bend of the relevant body mass trajectories in the fossil record. The 3/2 (2D) exponent for the horse (red) is predicted for evolution within a niche, where resource handling is optimal and net energy can increase only by an increase in the metabolic pace of resource handling. The exponent is declining to 5/4 (2D) or 9/8 (3D, green) for an unconstrained evolution where resource handling and pace are equally important for the increase in mass. This is expected as a base case for unconstrained evolution across ecological niches, and it is observed for the evolution of a maximum mass in four out of five mammalian clades across 30 to 64 million years of evolution. The predicted exponent is declining further to 3/4 (2D, blue) or 5/6 (3D) for a fast body mass evolution, where evolution in resource handling is outrunning evolution in metabolic pace. This downward bend is found for the trajectories for the maximum mass of trunked, and all terrestrial, mammals. An unbend trajectory, with a bending exponent of one (yellow) for 2D and 3D evolution, is predicted for evolution along a metabolic bound. And it is observed for the maximum mass of all heterotroph organisms across the entire span of 3.5 billion years of evolution on Earth. The bend of body mass trajectories over millions of years in the fossil record is confirming the Malthusian Relativity hypothesis that allometries and major lifeforms are selected by the primary selection of metabolism and mass. Witting, L. 2016c. The natural selection of metabolism bends body mass evolution in time. Preprint at bioRxiv http://dx.doi.org/10.1101/088997.